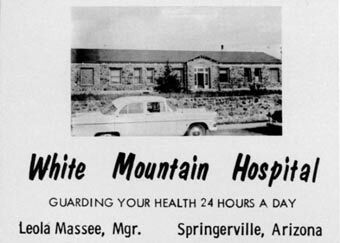 The first hospital building was a one-story rock building located on land donated by the Town of Springerville. It was a fifteen-bed hospital facility. Between 1959 and 1965 the citizens of southern Apache County, together with those in Catron County, New Mexico, launched an effort to raise funds for the construction of a more modern facility. This culminated in 1965 with the construction of the current hospital facility at a cost of $531,000. Half of this amount was purely donation and was matched by Federal Hill-Burton funds. At this time the White Mountain Communities Hospital bylaws were amended so that the corporation conducted business through a Board of Directors, each member representing a community within the service area. The Board entered a contractual relationship with Good Samaritan Hospital (later known as Samaritan Health System) in 1971 for management of the hospital facility. 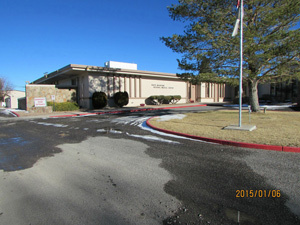 In 1982, the Board completed a $1.5 million expansion of the hospital. Samaritan opened a long-term care facility adjoining the hospital in 1987. In early 1995, Samaritan elected to end its relationship with the hospital facility, citing operating losses as the reason. This action created a crisis that seemed certain to lead to the closure of the hospital and the termination of many vital medical services. The citizens within the service area responded by mounting as "SOS" (Save Our Services) campaign. They held telethons, raffles, bake sales, and other activities to provide funds just to keep the hospital open on a month-to-month basis. Apache County and the Townships contributed, and local businesses collected donations in countertop glass jars. At the same time, a petition was circulated offering the creation of a special tax district to support medical services in the area. Action from the Arizona State Legislature allowed the proposition to be placed on a ballot. In July 1995, voters within the proposed tax district boundaries voted overwhelmingly to create the White Mountain Communities Special Health Care District. The District uses a small secondary property tax to help fund services for the Medical Center, Emergency Medical Services and primary care services. In August of 1997, the Board of Directors voted to change the facility's name to White Mountain Regional Medical Center. In August 2000, the Care Center (long-term care facility) was closed. White Mountain Regional Medical Center now has a swing bed program for long term care, up to 100 days for Medicare patients. Food Services, which include a consulting Registered Dietitian. White Mountain Regional Medical Center is currently a Level 4 Trauma Center. In 2014, the hospital also received Pediatric Emergency Certification. There are several physicians/providers located in the area that routinely use our facility in some capacity. In addition, there are many physicians with sub-specialties that visit the area providing ophthalmology, podiatry and general surgery services close to home.